In 2009 and 2010, we held a class titled: iiši neemankwi ašiihkiwi meehtohseeniwiyankwi aatotamankwi (Myaamia Ecological Perspectives and History) at Miami University. In this course we exposed our Myaamia students to the different ways their people see and understand the world around them. These understandings are formed from our people’s interactions with plants, animals, weather, and the changing seasons. In addition to those ecological perspectives, we also introduced them to the stories of our people’s past – our history. From these experiences, the class created a shared understanding of the web of relationships that links humans, animals, plants, and places together with our ancestors stories about the past (click here for class syllabi and materials). Each individual Tribal student spent the entire year observing one ecological feature: an animal, bird, tree, plant, weather phenomena, constellation, or solar body. Beginning in late summer, the student learned how to identify their “feature” and follow its changes as we moved into fall and then winter. In the spring, the student then watched closely as the world awoke. As students shared and discussed they learned how to connect the changes they observed with the changes observed by others. 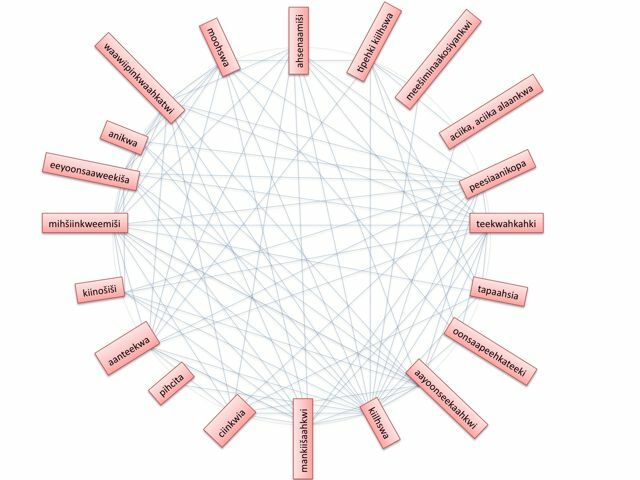 From these conversations students created a web of connections that linked all the features together (see image below). During the winter months, when we could not easily be outside, we spent our time discussing Myaamia history. Students worked to understand how our ecological perspectives and the stories of our past are bound together (to read more about this connection click here). We also discussed how historical understandings and ecological practices are a part of, or can be made a part of, the lives of Myaamia people today. Each student wrote a final essay for this class and these essays have been placed on this blog as a means of sharing what they have learned with their Myaamia relatives and any others who may be interested in their experience. The essays include ecological circles completed by the students and links to related essays. These essays represent their personal experiences of observing their world. Please feel free to ask questions in the comment sections. If possible the student author will give you a reply. If not, Daryl, George, or Andrew will do their best to respond in a timely fashion. To read about a particular student’s experience click one of the links below.